The idea of an anthology of stories devoted to visions of an after-life is inherently intriguing. To some degree or another, each of us has a sense—an intimation—of what we expect will happen after death. For some, it is clear, precise, highly detailed; for others, it is amorphous, vague, a presentiment only; for others still, it is merely a window onto emptiness, nothingness. 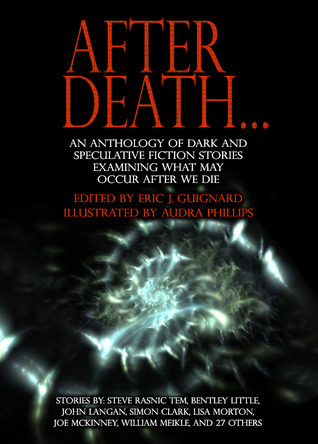 For all, however, as Eric Guignard notes in his introduction to After Death: An Anthology of Dark and Speculative Fiction Stories Examining What May Occur After We Die, it is an article of faith. Even for those of us who share a particular perspective based on religion, philosophy, or reasoned conclusions, the specifics of what we might expect will vary widely. I suspect that if a group of thirty or so like-minded ‘believers’—regardless of the source of those beliefs—were brought together in a room and questioned directly about heaven, the after-life, whatever it might be called, no two of them would agree in every detail. Even among religions that overtly preach a world beyond this, details are sketchy and, usually, left up to the individuals’ imaginations. That is why a book like After Death appeals. Its point, as Guignard also states, is not to “deliver affirmations but to offer suggestions. Anything is possible when the mysteries of the afterlife are concerned.” It is not a compilation of theological treatises, philosophical tracts, or anything of that sort—it is an anthology of stories, overt fictions, each set in a universe designed, implemented, and controlled by a writer’s unique, unrestrained imagination. And in those universes, anything might happen. The thirty-four tales present an extraordinary range of possibilities, from something approximating a ‘traditional’ view, as in Alvaro Rodriguez’s simultaneously horrific and comforting “Boy, 7” or Jamie Lackey’s sweetly satisfying “Robot Heaven,’ to situations as outré as that in Simon Clark’s “Hammerhead” or Benjamin King Ethridge’s “The death of E. Coli.” Some are stunning in their simplicity, as with Josh Strnad’s “Hellevator,” in which the single phrase “Well, what next?” takes on the weight of eternal damnation. Others are complex, capable of almost novelistic effects, as in Joe McKinney’s excellent “Acclimation Package,” a complex tale of life, death, and resurrection…sort of. I find myself wanting to comment at least briefly on every story, since each brought an entirely different sensibility to the theme. Just flipping through the anthology’s 300+ pages—noting titles, authors’ names, and the remarkably evocative and apt illustrations by Audra Phillips—reminds me of thoughts, images, mental explorations of my own stimulated by the stories. There are favorites; there are a few that I found I could not resonate as completely with…no surprise, since no anthology can hope to provide everything for everyone. But taken as a whole After Death is a strong collections, well-constructed, beautifully illustrated, and certainly worth reading.